Dallas Mavericks 2010-2011 NBA Champions - CONGRATULATIONS! 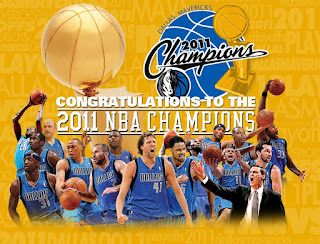 Congratulations to Dallas Mavericks as the 2010-2011 series NBA Champions! Finals MVP Dirk Nowitzki and company closed out their series with the Heat in game 6 Miami's homecourt with a 105-95 win on Sunday night. Congrats to Dirk/Kidd and the rest of the group!